This level has medium difficulty. 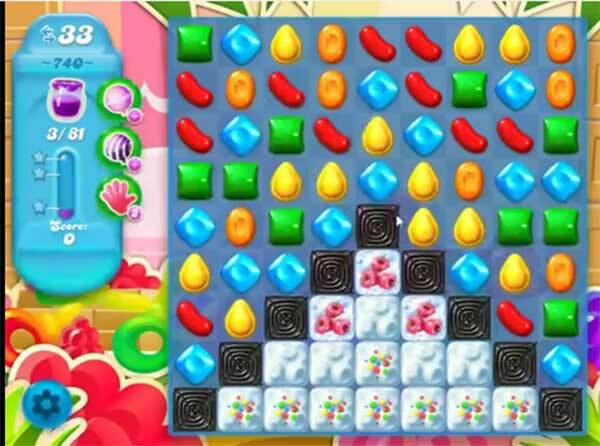 For this level try to play more from the bottom to shuffle the candies or play near to blocker to break them. Make special candy as you get the chance and combine them with each other to spread more Jam. I could make colour bombs myself on this level as so many candies of the same colour line up. Look for four candies of the same colour on a horizontal line but with a space in the middle, so a candy of the same colour on the line above it can drop into the space and make a colour bomb. Look at the vertical line that dissects the space and see if you can drop the same colour into it from above. There may be other colours horizontally above that that you can take out and then drop the right colour into the four candies which makes a colour bomb. You can’t do it from underneath the horizontal line because the candies in that line will drop and you have lost your aligned candies. This tip can occur in pretty well most of the levels. It can be done vertically but it doesn’t happen very often that you can slide a candy in from that position. It’s no longer 33 moves. It’s only 25. How do I do it with 25 moves?